Summary: Off the Menu is being called an extraordinary debut about second-generation Asian-American women trying to live up to society’s high standards, as well as their own. 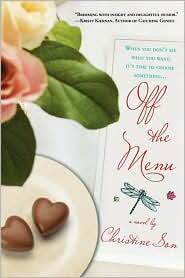 Off The Menu is the delightful, emotional, detail oriented, conversation filled debut novel by Christine Son. She has created three wonderful characters, two of Korean descent and one of Chinese who all bring so much to the long-time friendships they share with each other. Whitney, the lawyer with the secret dream of being a performance singer, Hercules, the successful and merciless chef with a father who never seems to be pleased by her accomplishments, and Audrey, the school teacher with ambitions of becoming a professor, though her mother may never understand her “settling” for just teaching. Together this dynamic trio faces all that life throws them at breakneck speed. Such trials and tribulations include a job firing, a monumental break-up, dealing with an aging parent, and even a road trip to Austin from their hometown of Houston. I enjoyed the characters of Christine Son’s Off The Menu and would recommend this book to anyone who has an interest in reading about friendship and the strength that it can bring to ones life. Now, for the highlight of this post. Thanks to TLC Book Tours, author Christine Son is here for her twelfth blog stop this month and has taken time to answer a few of my questions. Please join me in welcoming this up and coming author to Planet Books. Q: This is your twelfth stop on your TLC Book Tours run this month. What has been your favorite part of this experience? How did you pair up with TLC Book Tours in the first place? Do you feel that the sub-culture of book blogs and their readers are a powerful force in the book industry today? A: I have absolutely loved being on the TLC Tour. The wonderful Lisa Munley sent me an email about it, and I’m quite the fan of interviews and blogs, so it was a lovely fit. My favorite part of the experience has been reading what the commenters have to say, both about my guest blogs/interviews or the book itself. It’s invaluable to hear what people think of the book, to gauge what I might have done well or not so well. It’s also great to hear that people like me (can you believe it?) and that some are interested in the book because they think I’m nice or friendly (which I am!). I absolutely believe in the value of book blogs, and while it may be a subculture now, but will become the mainstream soon, if it’s not already. It’s the groundswell of opinion, and I love that. Q: The three main characters in OFF THE MENU have secret dreams that they are afraid of admitting to each other and their own families. Was writing this book your secret dream or did you share the whole process with your family and friends from the start? A: Writing was absolutely my secret dream. No one knew that I was writing except for my husband, and that was only because we live together, and he was going to wonder why I was acting like such a loon (and also because I adore and trust him, obviously). At some point pre-publication, I told a couple of very close friends that I was writing, but that may have been in response to their concern that I was looking a bit rough. They were worried that something was going on in my personal life or that some calamity had occurred. It was just utter exhaustion from working all day and then writing all night. The feelings that the characters share–fear of failure, fear of disappointing their friends and families and themselves, fear of looking like a fool or a frivolity–those were very real to me. But, and also like the book, I realized that my friends are my friends because we love each other, and if I can’t share some of the most important aspects of my life with them, then what does that say about our relationship? Or about me as a confider or confidante? Q: Your main characters, Whitney, Hercules & Audrey, all have very demanding, loving and seemingly unforgiving and hard to please parents. Are they a culmination of your own parents? A: Well, my parents are incredibly supportive of my writing career and of me in general. And they’re not terribly hard to please in the traditional “you’d better bring home an A+” sense (if only because I’m no longer in school!). At the same time, I do feel pressure to do right by them, to live up to the expectations that they have for me, although not because they think that my success is their entitlement, but because they think I’ve got a lot of potential. My mom tells me all the time that “you can do it,” no matter what the goal is. She doesn’t qualify her assertion. She doesn’t hem and haw and try to dissuade me. And that’s really encouraging, knowing that she already believes that I can achieve whatever I’ve set my mind to. Q: Have you ever gone on a road trip/vacation with your girlfriends? If so, did anything outrageous happen? A: I have! Several of my close girlfriends and I take an annual Vegas trip. Many outrageous things have happened, but they’re all in the vault, and the vault stays locked. Sorry! Actually, our girl trips, in part, inspired the characters’ decision to take a trip together. Something about being away seems to draw friends closer and affords opportunities for more soul-baring than when we’re all in town. Even if we see each other often. Maybe it’s the proximity, or the endless time together. Or the vulnerability utter exhaustion brings. I love girl trips. Q: What are your single most favorite things about being both a lawyer and a writer? A: I love that I can be creative in both fields. I’m a litigator, and by job requirement and personality, I’m very analytical and curious. How is my client going to react? How is my opposing counsel or the judge or the jury going to respond? And as I did when I was a child, I’m constantly asking why. Factual gaps in cases force me to consider all the things that might have happened, and the more I practice, the more I think about hypothetical situations. In writing, it’s the same thing. How is a character going to respond? How is she going to handle a dilemma or make her dream come true? Why does she do it? What are her motivations and thoughts and perspective? The two practices are so similar, which might be why so many lawyers want to write. Q: What were some of your favorite books that you have read this year? A: I’ve been reading a lot of YA fiction these days, and they have blown me away with their maturity and riveting prose. I absolutely adore Sherman Alexie’s The Absolutely True Diary of a Part-Time Indian, John Green’s Looking for Alaska and An Abundance of Katherines, Ibi Kaslik’s Skinny, Jay Asher’s Thirteen Reasons Why and Sara Zarr’s A Story of a Girl. Really, YA fiction is unbelievably good. I’ve got a three-foot stack of unread books on my nightstand, most of it YA fiction. I also read David Sedaris’s When You’re Engulfed in Flames. Ha! So funny. 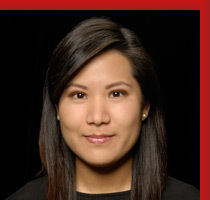 Christine Son graduated from the University of Texas and Duke University School of Law. She works as Corporate Counsel for a Fortune 500 company in Dallas, Texas where she lives with her husband. For more fun facts about Christine, and answers to questions such as “What are you?” and “What do you do in your free time?”, click HERE. Great post! I’ve been following the tour, and Christine’s interviews and guest posts have been a pleasure to read! I’m so looking forward to my tour date!! My daughter in law is Chinese (and she has very high standards for herself too!) so I’m especially interested in the perspective of Asian American women. Great review! I love friendship stories, and this one sounds very good.